In a filing made late on Friday by local time, Apple points to a California jury's finding of willful patent infringement by Samsung and "requests an enhancement of $135 million under the Patent Act and $400 million under the Lanham Act, for a combined total of $535 million". Additionally, Apple asks for supplemental damages based on Samsung's sales in the period from July 1 (since the jury only looked at damages for the period until June 30) and Judge Koh's final judgment, amounting to another $121 million, and $50 million of prejudgment interest to offset the delay until Apple gets paid. The total of these additional demands is $707,061,678 if the district court proceedings are concluded on December 31, 2012. 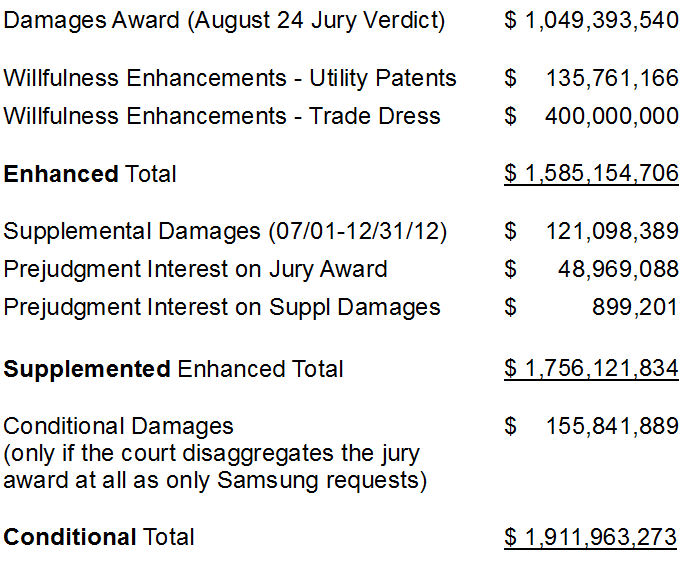 The total of the jury's August 24 damages award ($1,049,393,540) and Apple's requested enhancements, supplemental damages and prejudgment interest would be $1,756,121,384 ($1.756 billion). The amount could even go up to $1,911,963,273 if the court grants Samsung's wish to disaggregate the jury award but ends up agreeing with Apple. Now that I've provided an overview, let's look at each item. 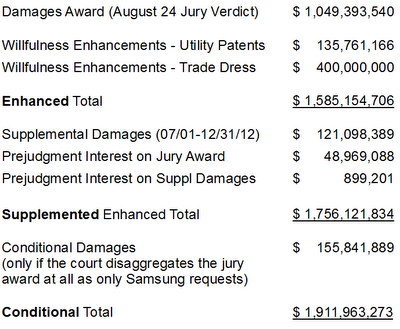 Contrary to what was speculated in Korea and elsewhere, but consistent with what I've been saying since the verdict, Apple recognizes that only some parts of the $1.05 billion damages award by the jury are subject to enhancement for willful patent infringement. Apple is smart enough to know that asking for the moon without a legal basis wouldn't do any good, neither in the court of law nor in the court of public opinion. Apple is defending its intellectual property, and not just being greedy. Apple requests a tripling for willful patent infringement of an amount of $67,880,583 "for the five smartphones and two tablets that [the jury] found to infringe only Apple's utility patents [...] resulting in enhancement of $135,761,166 for a total award on those products of $203,641,749". Those parts of the damages verdict do not include the disgorgement of profits that presumably accounted for the bulk of the jury's damages awards concerning products that infringed both design and utility patents. Additionally, Apple asks for a $400 million under the Lanham Act (i.e., U.S. trademark law) for infringement of trade dress, resulting in "a total increase in the judgment of $535,761,166" for the willfulness part. Apple's argument is based not only on the jury's finding of willful infringement of most of the intellectual property rights involved but also on Samsung's overall conduct, including litigation-related misconduct it was sanctioned for a few times. Apple also asks for supplemental damages based on Samsung's sales between July 1 and the final resolution of the current proceedings in Judge Koh's court, and for prejudgment interest. The jury awarded damages only for the period until June 30, 2012. In its Rule 50 motion ("overrule-the-jury"), Apple conditionally ask for an increase of parts of the damages figure. Apple would prefer for the court to accept the jury's damages verdict as final (except for the willfulness enhancements I just explained, and additional damages for the period since the verdict). But if the court grants Samsung's wish to review the overall damages award, then Apple wants a shot at getting more money. In particular, Apple says that there are five products for which the jury awarded less than the undisputed amount calculated by Samsung's own expert, and if the court agreed, this would result in an additional $155,841,889 ($155 million). That $155 million amount is not included in the $707 million total I stated above because it's only a conditional request -- the $707 million is the total of all unconditional requests. Even the $1.9 billion figure in the chart I showed you above isn't the grand total. Since Apple also wants to prevail on some items on which the jury disagreed, the amount would increase further if any of Apple's Rule 50 requests results in additional liability findings. "Captivate, Continuum, Droid Charge, Epic 4G, Exhibit 4G, Fascinate, Galaxy Ace, Galaxy Prevail, Galaxy S, Galaxy S 4G, Galaxy S II (AT&T), Galaxy S II (i9000), Galaxy Tab, Galaxy Tab 10.1 (Wi-fi), Gem, Indulge, Infuse, Mesmerize, Nexus S 4G, Replenish, Vibrant, Galaxy S II (T-Mobile), Transform, Galaxy S Showcase, Galaxy S II (Epic 4G Touch), Galaxy S II (Skyrocket)"
But, very importantly, Apple's motion asks for an injunction that would not be limited to the exemplary infringing products but would also cover "any other product with a feature or features not more than colorably different from any of the infringing feature or features in any of the Infringing Products". I've been talking about this for some time. If Apple's motion for a permanent injunction is granted, Samsung will also have to avoid infringement of the relevant intellectual property rights with any other products, including the Galaxy S III. Judge Koh has previously granted Apple two "colorable difference" injunctions against Samsung, and the wording proposed by Apple here is consistent with the approach established by the Federal Circuit in its TiVo v. Echostar opinion.